As August nears completion, I find myself looking back yet again to wonder where the time went. Work, ever greedy, has been taking more than its share lately, and 3rd grade for Alison means facing the chaos of order, to which we must now readjust. When we add in some tackling of the to-do list and its items that have, in some cases, plagued me for years, there hasn’t been much time left for anything else. So when the possibility arose of two glorious, consecutive days off coinciding with last Monday’s solar eclipse, I jumped at the chance to squeeze in as much adventure as possible. Carl and the kids were ready and waiting when I got off work on Saturday; I changed my shirt, slung my duffel bag in the back of the Jeep, and we hit the road, heading south to Kentucky. 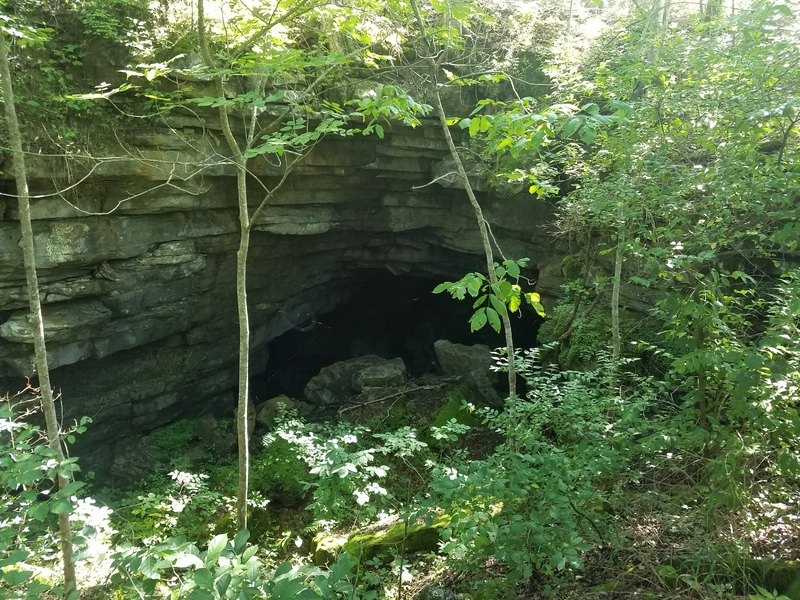 Down in Somerset, about four hours from home base in Indy, is Wells Cave, stretching eight miles according to some sources, and fifteen to others. Our own source was an article in the guidebook for the National Speleological Society’s convention in 2001 and an incomplete map included as an illustration. On Sunday morning, accompanied by our friend Squirrel, we set out to go off the map. The yawning cave mouth slopes down into mossy piles of breakdown and fragments at the bottom into a collection of passages, some circling around to where they began, and others continuing off toward unknown end points. We didn’t spend a whole lot of time pushing passage, mainly staying in the larger walking passages, due to Ali’s presence; at eight years old, though a fledgling explorer in her own right, she has yet to develop fully the drive and the stamina required for an extended trip. In the midst of the breakdown in the entry, we found a drop-down to a passage extending nearly perpendicular from that front room which then split off into a few directions, many of which looping back around to the starting point. 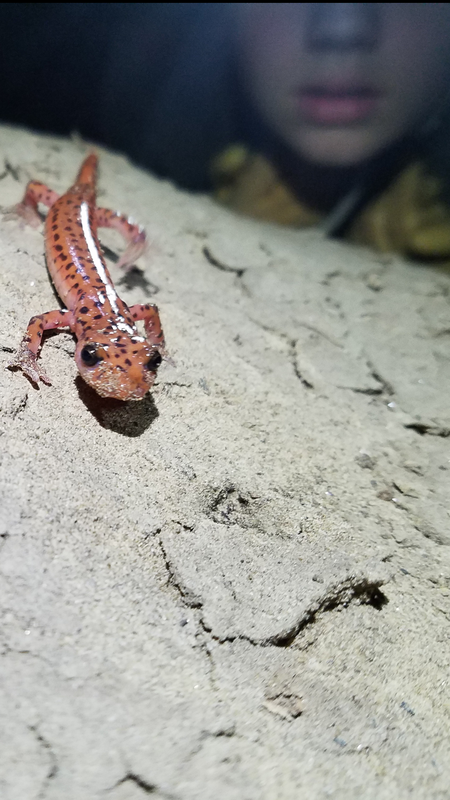 Aside from a large, curious salamander, we didn’t find much down there and returned to the upper level. To the left of the breakdown room was another passage, roomy with a ceiling some twenty or thirty feet overhead, which led into a second breakdown room sloping down to the stream level, which gushed out from between the rubble at the lowest point. Left again and the passage narrowed to a slot canyon which jogged around the stream, and at one point opened up to show a rather sketchy ladder, bottom rung missing, leading up to a ledge from which I could see a knotted rope dangling above. I ascended the ladder and tried the rope, which held my weight but without any decent foothold or safety measures I abandoned the idea and descended again. The last passage we investigated was a long crawl scattered with copious river rock, the kind that wreaks havoc on the knees, even with appropriate padding. Carl and I went back a ways to before turning around, but as the passage didn’t open up, we opted not to drag the kids back. We regrouped in the second breakdown room and headed out shortly thereafter, though not before discovering claw marks in the walls and ceiling, apparently left by a frustrated bear who had found its way in at one point and had trouble finding the way back out. After we finished up at Wells, we parted ways with Squirrel and headed on south to Sevierville, Tennessee, where we spent Sunday night. 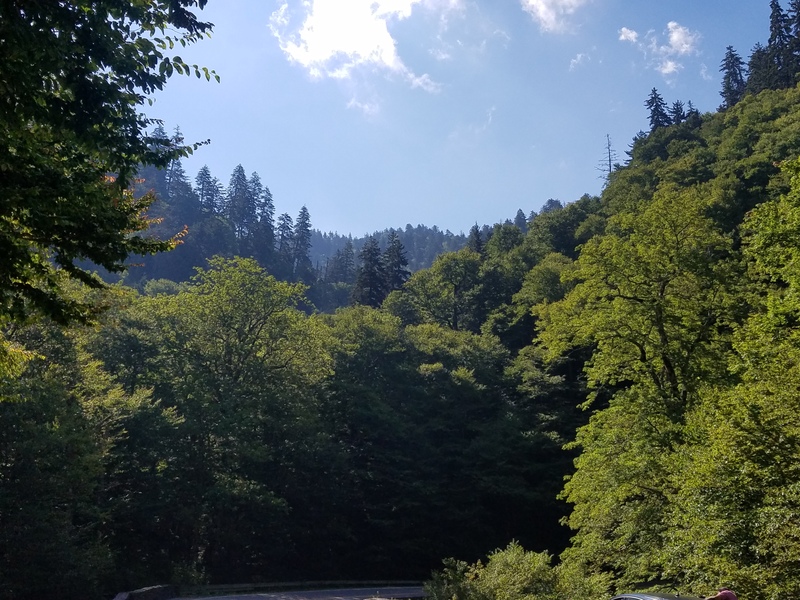 Monday morning we headed to the Great Smoky Mountains National Park to scout out a place for watching the eclipse; apparently hordes of others had the same idea, though, so we drove on south through the park into Cherokee, North Carolina to try to find a better spot. A campground that we discovered was equally full, so we followed the road through the mountains out of town. It seemed like every field was packed with cars and people, camp chairs set out and waiting. We drove on. We turned on to a back road, then another, and Carl and I both saw the sign at once for Bumgarner Cemetery, hidden away behind a cornfield, and the decision was made. We were amazed to find a car already there, but compared to the crowds elsewhere, we were willing to compromise, so we shared the cemetery with four ladies local to the area, or perhaps it’s better said that they shared it with us; while we stumbled upon it by chance, they had scouted out the area the day before. 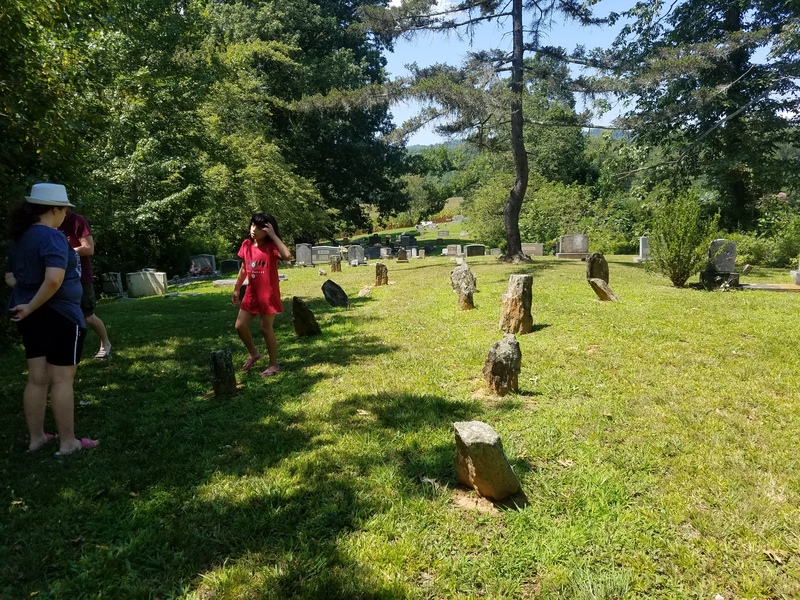 The site was located on a hilltop, ringed with mountains, buttressed by the cornfield on the south side and strangely enough, a pen with llamas and donkeys on the north; to the west extended the cemetery’s newer plots, with the eastern end nearly crumbling to dust, some barely legible markers bearing dates from the 1800s, others having worn down beyond any ability to decipher. We watched the world darken from our hilltop perch as the moon began its transit of the sun. At first it was like a cloudy day, the light breaking through, and then a darkness grew, but strange, without the slanting shadows that the evening sun will throw. It struck me more like looking through eyes filmed with exhaustion, where darkness lingers at the periphery and fills out the details. We lay on our backs on blankets, spread there in the graveyard, and watched the sun disappear. 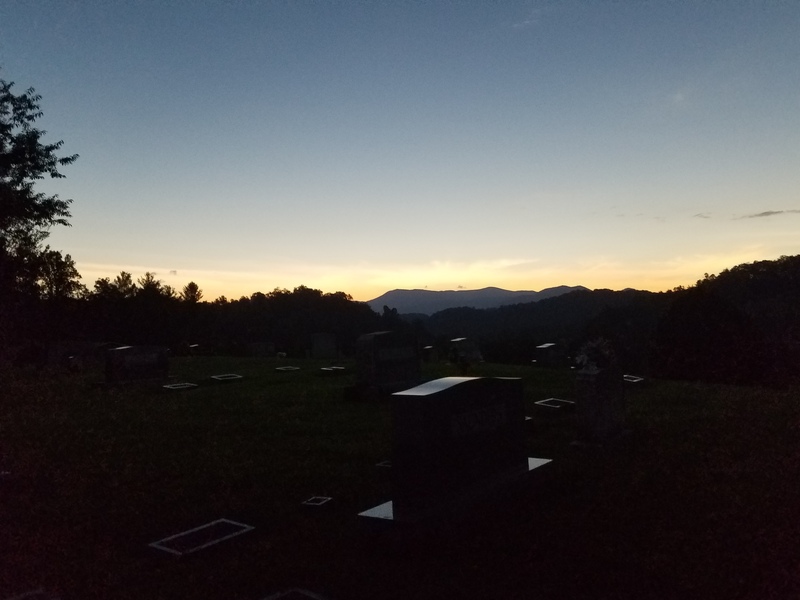 Behind us sprang up the colors of sunset over the mountains like a southern aurora, glowing over the town beyond our view and its multicultured population, evinced by street signs bearing names in both English and Cherokee. Totality was a breathtaking two minutes when the sun, still fiercely opposing any darkness, refused to be occluded by the moon and flared out around it. 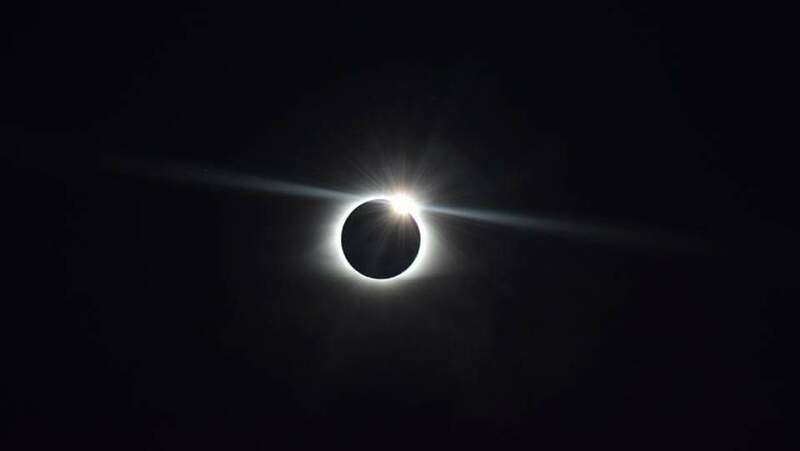 The crowning moment was as totality ended, when the sun began to peek out again, sparkling like a diamond. My camera failed to capture the beauty of that moment, but Carl was able to snap some beautiful shots of the end of totality, as below. As the eclipse ended, we returned to the reality of a long drive home and work until the next adventure.